I don't see any improving, maybe in the accent department, but the voice is still the same. Apsara used the right word: shrill. She's very captivating on stage, she seems like a very sweet girl, but her voice makes me want to run away. And not only it's annoying in itself, it's so squeaky it can't support all the instruments they're throwing at her. I like it It sounds much better than they have in a pretty long while. I think Ailyn has the potential to become a really good singer. Frankly, I must admit I was never a fan of Sirenia, but after hearing their new album I was truly surprised how much this band improved. IMHO, PFTDB is by far their best album and what I really found the most amazing was Ailyn and her improvement in her vocals. Unfortunately, Ailyn is a very underrated vocalist. I know that i am probably in minority, but I really like these kind of voices- I mean a light lyric soprano voice- clear, bright, lyric voice with childlike quality. Moreover I think that Ailyn's got a instantly recognizable voice and she's showing she is a really good singer with a good range and big potential. Her sustained E6 in song Cold Caress is so fantastic. I think that she can sing even higher. Yuck. I agree. The way he talks about other bands is disgusting. It's not very professional. Floor recently said that she doesn't particularly care for Within Temptation or Delain, citing their radio friendly melodies as the main reason, but she also added that she as a fellow musician respects their talent regardless of her personal taste. It's very important to have this attitude. Comments like that makes me want to draw the conclusion that Morten is bitter about SIrenia not being anywhere near as successful as the bands he trashed. But seeing how many people in the business are friends with one another he's just burnt his bridges. I actually like the new Sirenia album and I think that if he had been patient and worked hard, he could very well have received an opportunity to open for a band like Epica. Speaking of connections; Nightwish is already connected to most bands in the genre - either directly or indirectly - through Floor and Marco. God he does souns arrogant! At least if you feel like you are the most perfect band you don't have to say that out loud while trashing other bands! And since when are Sirenia so original and innovative? Anyway i found the new album quite good too and i agree with Magnus! Hmm. For someone, who is trying [but failing] to make the same album over and over again is very strange to accuse other bands in lack of originalty. To me as a big Tristania fan Morten has only two good albums - Widow's Weeds and Beyond the Veil. And while his ex-band succeed to write interesting albums after his departure, the only thing he has done is to follow the recepie of ToT. And to put good looking girls with awful voices for frontwomen. Man, even Epica sound more innovative than Sirenia and this is telling a lot. Also the "choir thing" is not his creation. So, Morty, please - get your pills! Oh, lol, the kettle calling the pot black! Tristania and After Forever are far more original and integre then Sirenia has ever been. It's really funny to hear talk about originality and not compromising a band that is so artificial and phony and trying so hard to appease both the metal listeners and the pop listeners and ends up making a mess of mix that is liked by neither category. Oh lord that interview! I agree with Neinor, someone needs his meds, the crazy is starting to come out. ...Also, I really hate the album art. Does anybody else think the mermaid on the album cover is a dead ringer for Lady Gaga? I swear, it's all I can see when I look at this album. Anyway, I stumbled upon a promotional video for this album and was pleasantly surprised by Ailyn's vocals. A few years back I gave "The Path to Decay" a chance and wasn't too impressed: the music was nothing special and Ailyn's voice sounded bored and - as so many people have said before me, shrill. I didn't really give them another look until this album was released. The improvement is amazing - the music is much more varied and interesting and Ailyn's vocals are a lot more dynamic. Her head voice and her lower range are actually beautiful. At times, she is still shrill, but I'm learning to appreciate her voice for what it is - she really should be commended for the effort she has put in to improve. Anyway, I've been listening to this album quite a bit over the past two weeks - it's not perfect (Biggest thing for me were the lyrics - some of them are good, but a few of the songs could use work in this area), but overall it's really quite enjoyable. They've done a good job and I'll keep my eye on them for future releases. They're doing a very small show in Australia in December apparently, and now I'm tempted to go and give them a shot live. It's quite possible they might never return here again. Tickets are pretty cheap - does anybody know if they are any good live? Saw them live on their "The 13th Floor"-tour in 2009. They were ok - played a good show and had a lot of interaction from Aylin + I was quite surprised by Aylin's live vocals, but overall I thought they lacked some movement and punch. Maybe some pyro, fireworks or other scene effects would be better. And also, they don't have a bass or keyboard player so both the bass tracks and orchestral tracks are playback, I know that can put off a lot of people. I really like Ailyn, she seems very engaged in what she does And she gets better for every album. I haven't seen them live though. @Marius I don't think a few playback tracks would bother me too much. Their studio work has improved recently, so if you saw them in 2009, it's possible that their live shows may have also improved. The venue is going to be quite small though, so I expect nothing more than some fancy lights - it is completely out of the blue for a band like Sirenia to come and play a show here, and I'm unsure of how many fans they actually have out here. Half of the people attending would probably be like me - only somewhat familiar with them and curious. It's either going to make the show feel really plain and underwhelming, or the close proximity will serve as a distraction and make everything feel huge. I saw Kamelot live in quite a small venue, and the show was amazing - I didn't notice how small the venue was at all once they hit the stage, so I'd be hoping for something similar here. @Eilenna She does seem like a pretty good frontwoman. I agree that she seems to enjoy and engage in what she does and based on that video, it seems she's a pretty competent live singer too. I looked them up on setlist fm and their setlists seem to always get dominated by their most recent albums, and based on the strength of PotDB, I might as well go and give them a shot. I'd pretty much be going just to hear them do the new songs live, but I get the feeling they're doing the shows here as a trial run for the new material anyway and to test out an unfamiliar market - I imagine they'll be keen to play most of the new songs live. I still have regrets over skipping Eluveitie this year, but I at least know they will be back. Sirenia are playing an incredibly small show here (about 200 people max), and it is being advertised as possibly the only opportunity for Australians to see them locally, so I'd hate to miss it and realise later that I should have gone. $50 isn't much at all, so it's probably a good idea to take a chance here. I despise the new album. <_< This is the reason I usually use a pirate site to get a free preview of albums by iffy bands like them before shelling out money for an actual copy. That way I can just delete it if I hate it with no money lost, and buy the real deal if I like it; no harm, no foul. ...But everyone was saying how awesome it is, and that Ailyn has been applying more classical technique, so I just went ahead and bought it. ...iTunes doesn't give refunds... <_< At least it was only $9.99. Ailyn should be using more classical technique for her head voice to project, rather than trying to belt with it. She sounds lovely when vocalizing at the end of Cold Caress, but sounds very much as though she just gave a bj to a helium tank for the rest of the song, and the rest of the album, for that matter. Blah. It's a shame, but I actually like The 13th Floor more than this. She sounds bored, yes, but at least she isn't trying to force the volume like she is here. Ouch. Just, ouch. Well personally I listened to their last album and I didn't really like it... It's not that it's bad, just that there's something missing... I mean, the music was not bad, but nothing sounding original to me, and I didn't like the vocals either... Her voice is too light, too thin for my ears. But I've never listened to them live nor to their previous albums so maybe I should to have a better idea. ^ Welcome to the forum. Ouch, right? But as I mentioned in my previous comment, the more classical vocalizations at the very end are very nice. She is straining herself, and therefore, sounds strained. It's a pity, because I really like her voice type. But they're just not built to belt with their head voices. I like her version although I personally preferred Monika's voice.. Personally, i really prefer Monika for Sirenia than Ailyn. Monika's voice is great in its own unique way. Their vocalist on their debut album was also amazing, but too bad they replace her with Henriette. Seven Widows Weep gets better everytime I listen to it. Doesn't happen often with songs but I really don't like the video for the song. Maybe I should listen to the album because I haven't paid that much attention to Sirenia's work in the past years. I can't be arsed to buy the album, but I have given all the songs a few listens on spotify. It's thoroughly enjoyable, and Ailyn sounds awesome. When belting her high notes, it does indeed not sound too pleasant, but I think it works for this album. To me, this album made me go "what? Sirenia released new material that's actually good?" To be honest, the last album I enjoyed was Nine Destinies and a Downfall, and after that, it's all been pretty boring... 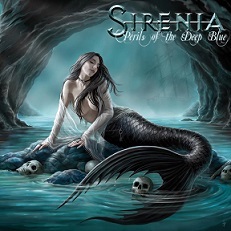 Perils of the Deep Blue is the first solid release(in my opinion) from Sirenia in several years. Ailyn sounds fine. Not even close as good as Vibeke, but I must say that she is getting better now. Although I've become sick of operatic vocals in metal lately, I think that classical training would benefit her. She sounds ethereal with classical technique, and her squeaky sound that always annoyed me slightly disappears. I always thought that her voice is fine, she has range and everything, but her timbre was always something that always appalled me. Hmm, I think that you are exaggerating a little bit. Besides writing 2 great Tristania albums, he also wrote two excellent Sirenia albums. And it is logical that early Sirenia sounded like first 2 Tristania albums. The same songwriter wrote them. So, Morten isn't stealing anything from Tristania, or whatever. It was his style, and he brought it with him to Sirenia. But it is too bad that it lasted for only 2 albums. Nine Destinis and a Downfall was even okay... but when I first listened to Lost in Life from 13th Floor... auch! It sounded like something from Eurosong contest. But now, with this new album, I have high hopes. Liked the video! She sounds really good! Oh and must say I LOVE Ailyn's oufits! I was just about to be shocked by how well she nailed the song (even though her vocals are paper thin and lack any substance, it sounded pretty good and she hit the high notes with surprising easiness), when she reached the bridge. And then..... that was really really bad. Completely off tune and I think her voice broke a few times and it pretty much ruined the good impression I had by the middle of the song. And I still can't get over the fact that Morten wrote one of the best songs in the world and then followed up with The path to decay & co.